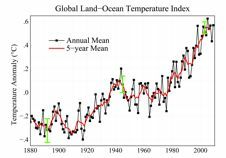 Although 2008 was the coolest year of the decade, due to strong cooling of the tropical Pacific Ocean, 2009 saw a return to near-record global temperatures. The past year was only a fraction of a degree cooler than 2005, the warmest year on record, and tied with a cluster of other years — 1998, 2002, 2003, 2006 and 2007 1998 and 2007 — as the second warmest year since recordkeeping began. “Of course, the contiguous 48 states cover only 1.5 percent of the world area, so the U.S. temperature does not affect the global temperature much,’ said Hansen. Three others key factors — including changes in the Sun’s irradiance, oscillations of sea surface temperature in the tropics, and changes in aerosol levels — can also cause slight increases or decreases in the planet’s temperature. 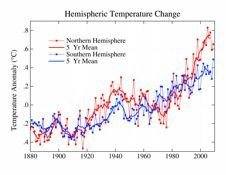 Overall, the evidence suggests that these effects are not enough to account for the global warming observed since 1880. Global temperatures tend to decrease in the wake of La Niña, which occurs when upwelling cold water off the coast of Peru spreads westward in the equatorial Pacific Ocean. La Niña moderates the impact of greenhouse-gas driven warming, lingered during the early months of 2009 and gave way to the beginning of an El Niño phase in October that’s expected to continue in 2010. An especially powerful El Niño cycle in 1998 is thought to have contributed to the unusually high temperatures that year, and Hansen’s group estimates that there’s a good chance 2010 will be the warmest year on record if the current El Niño persists. At most, scientists estimate that El Niño and La Niña can cause global temperatures to deviate by about 0.2°C (0.36°F). In contrast, the GISS analysis extrapolates data in those regions using information from the nearest available monitoring stations, and thus has more complete coverage of the polar areas. 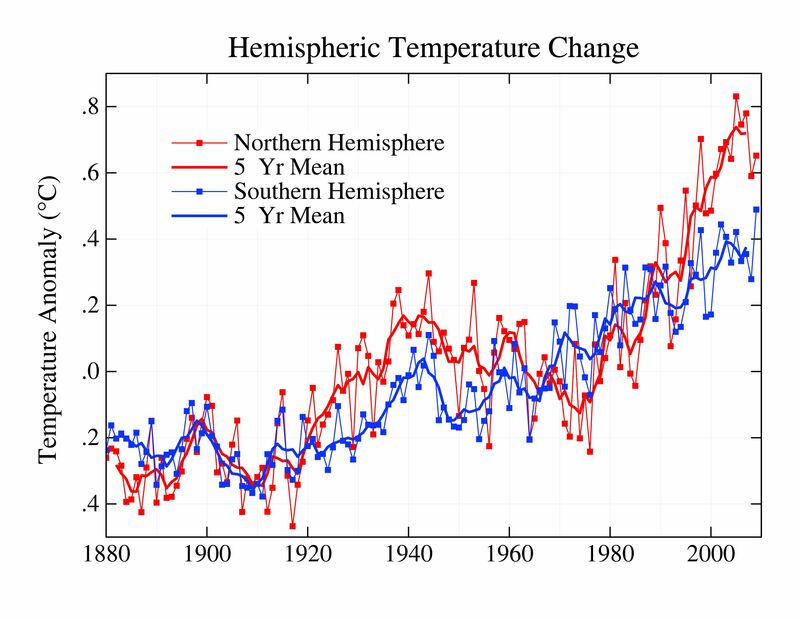 If GISS didn’t extrapolate in this manner, the software that performs the analysis would assume that areas without monitoring stations warm at the same rate as the global mean, an assumption that doesn’t line up with changes that satellites have observed in Arctic sea ice, Schmidt explained. Although the two methods produce slightly different results in the annual rankings, the decade-long trends in the two records are essentially identical. Adam Voiland, 301-352-4631, NASA Goddard Space Flight Center, Greenbelt, Md. This article is derived from a NASA Looking at Earth news feature. This entry was posted on Friday, January 22nd, 2010 at 7:01 pm	and is filed under Uncategorized. You can follow any responses to this entry through the RSS 2.0 feed. Both comments and pings are currently closed.